We affectionately refer to these as "Poor Man's Splitter Snakes", because they are a rock bottom basically simple splitter snake. These snakes do not have splitter transformers, ground lift switches, or multi-pin disconnects. They are simply hardwired Y splits, with basically a stage box and two hardwired short trunks with fantails. The stage box is very heavy duty and well labeled. Both fantails are ruggedly built, color coded to groups and very well labeled. 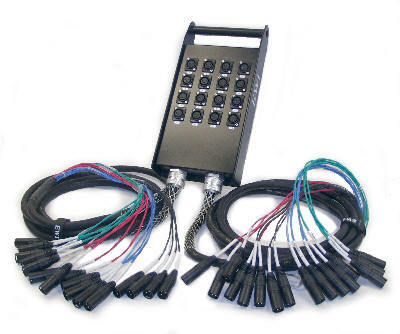 Both the main trunk and split trunk are constructed with EWI SMC cable which is 16 individual shielded pairs, 22 gauge, high copper purity conductors with double aluminum foil shield and trace wire, which is fairly rugged, lightweight, and very flexible. 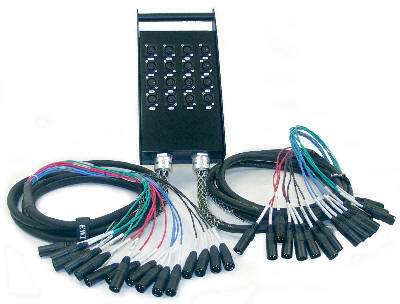 The Female XLR panel jacks are the buttonless "coiled spring style" with composite (non metallic) bodies. The fantail is constructed with EWI ES3MB-GDP (MXLR) black shell with gold contact point connectors. This is a good quality snake, suitable for professional applications. It even comes with nifty blue bags to protect the fantails when not in use. It's just a straight ahead snake of simple "Y" splits, but it might be a cost effective solution for a split snake application. Splitting XLR signals for dual feeds. Connectors: EWI EP3F Female XLR panel jacks and ES3MB-GDP Male XLR cord ends.